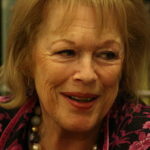 Antonia Fraser is a British author of history, novels, biographies and detective fiction. She is the widow of the 2005 Nobel Laureate in Literature, Harold Pinter (1930–2008), and prior to his death was also known as Lady Antonia Pinter. "I think there’s a tremendous split between people who’ve been through a war and people who haven’t." "I think there has been a great deal of valuable revisionism in women’s history." "My advantage as a woman and a human being has been in having a mother who believed strongly in women’s education. She was an early undergraduate at Oxford, and her own mother was a doctor."